"If we want to find an exoplanet that can develop and sustain life, we must figure out which stars make the best parents," said Vladimir Airapetian, lead author of the paper and a solar scientist at NASA's Goddard Space Flight Center. "We're coming closer to understanding what kind of parent stars we need." The new habitability model has implications for the recently discovered planet orbiting the red dwarf Proxima Centauri, our nearest stellar neighbor. Airapetian and his team applied their model to the roughly Earth-sized planet, dubbed Proxima b, which orbits Proxima Centauri 20 times closer than Earth is to the sun. Considering the host star's age and the planet's proximity to its host star, the scientists expect that Proxima b is subjected to torrents of X-ray and extreme ultraviolet radiation from superflares occurring roughly every two hours. They estimate oxygen would escape Proxima b's atmosphere in 10 million years. Additionally, intense magnetic activity and stellar wind – the continuous flow of charged particles from a star – exacerbate already harsh space weather conditions. The scientists concluded that it's quite unlikely Proxima b is habitable. "We have pessimistic results for planets around young red dwarfs in this study, but we also have a better understanding of which stars have good prospects for habitability," Airapetian said. "As we learn more about what we need from a host star, it seems more and more that our sun is just one of those perfect parent stars, to have supported life on Earth." 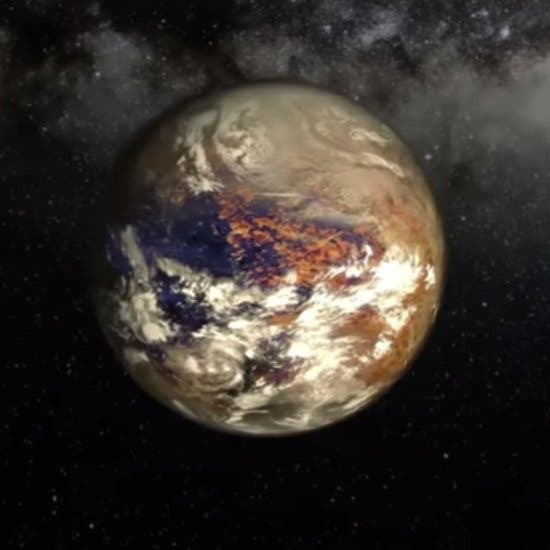 The search for life beyond Earth starts in habitable zones, the regions around stars where conditions could potentially allow liquid water – which is essential for life as we know it – to pool on a planet's surface. New NASA research suggests some of these zones might not actually be able to support life due to frequent stellar eruptions – which spew huge amounts of stellar material and radiation out into space – from young red dwarf stars. In the video below StarTalk Radio host and SETI Institute Senior Astronomer Seth Shostak and his guest, Penn State Associate Professor of Astronomy Jason Wright discuss the discovery of Proxima B. Now, an interdisciplinary team of NASA scientists wants to expand how habitable zones are defined, taking into account the impact of stellar activity, which can threaten an exoplanet's atmosphere with oxygen loss. This research was published in the Astrophysical Journal Letters on Feb. 6, 2017. To determine a star's habitable zone, scientists have traditionally considered how much heat and light the star emits. Stars more massive than our sun produce more heat and light, so the habitable zone must be farther out. Smaller, cooler stars yield close-in habitable zones. But along with heat and visible light, stars emit X-ray and ultraviolet radiation, and produce stellar eruptions such as flares and coronal mass ejections – collectively called space weather. One possible effect of this radiation is atmospheric erosion, in which high-energy particles drag atmospheric molecules – such as hydrogen and oxygen, the two ingredients for water – out into space. Airapetian and his team's new model for habitable zones now takes this effect into account. The search for habitable planets often hones in on red dwarfs, as these are the coolest, smallest and most numerous stars in the universe – and therefore relatively amenable to small planet detection. "On the downside, red dwarfs are also prone to more frequent and powerful stellar eruptions than the sun," said William Danchi, a Goddard astronomer and co-author of the paper. "To assess the habitability of planets around these stars, we need to understand how these various effects balance out." Another important habitability factor is a star's age, say the scientists, based on observations they've gathered from NASA's Kepler mission. Every day, young stars produce superflares, powerful flares and eruptions at least 10 times more powerful than those observed on the sun. On their older, matured counterparts resembling our middle-aged sun today, such superflares are only observed once every 100 years. "When we look at young red dwarfs in our galaxy, we see they're much less luminous than our sun today," Airapetian said. "By the classical definition, the habitable zone around red dwarfs must be 10 to 20 times closer-in than Earth is to the sun. Now we know these red dwarf stars generate a lot of X-ray and extreme ultraviolet emissions at the habitable zones of exoplanets through frequent flares and stellar storms." Superflares cause atmospheric erosion when high-energy X-ray and extreme ultraviolet emissions first break molecules into atoms and then ionize atmospheric gases. During ionization, radiation strikes the atoms and knocks off electrons. Electrons are much lighter than the newly formed ions, so they escape gravity's pull far more readily and race out into space. Opposites attract, so as more and more negatively charged electrons are generated, they create a powerful charge separation that lures positively charged ions out of the atmosphere in a process called ion escape. "We know oxygen ion escape happens on Earth at a smaller scale since the sun exhibits only a fraction of the activity of younger stars," said Alex Glocer, a Goddard astrophysicist and co-author of the paper. "To see how this effect scales when you get more high-energy input like you'd see from young stars, we developed a model." The model estimates the oxygen escape on planets around red dwarfs, assuming they don't compensate with volcanic activity or comet bombardment. Various earlier atmospheric erosion models indicated hydrogen is most vulnerable to ion escape. As the lightest element, hydrogen easily escapes into space, presumably leaving behind an atmosphere rich with heavier elements such as oxygen and nitrogen. But when the scientists accounted for superflares, their new model indicates the violent storms of young red dwarfs generate enough high-energy radiation to enable the escape of even oxygen and nitrogen – building blocks for life's essential molecules. "The more X-ray and extreme ultraviolet energy there is, the more electrons are generated and the stronger the ion escape effect becomes," Glocer said. "This effect is very sensitive to the amount of energy the star emits, which means it must play a strong role in determining what is and is not a habitable planet." Considering oxygen escape alone, the model estimates a young red dwarf could render a close-in exoplanet uninhabitable within a few tens to a hundred million years. The loss of both atmospheric hydrogen and oxygen would reduce and eliminate the planet's water supply before life would have a chance to develop. "The results of this work could have profound implications for the atmospheric chemistry of these worlds," said Shawn Domagal-Goldman, a Goddard space scientist not involved with the study. "The team's conclusions will impact our ongoing studies of missions that would search for signs of life in the chemical composition of those atmospheres." Modeling the oxygen loss rate is the first step in the team's efforts to expand the classical definition of habitability into what they call space weather-affected habitable zones. When exoplanets orbit a mature star with a mild space weather environment, the classical definition is sufficient. When the host star exhibits X-ray and extreme ultraviolet levels greater than seven to 10 times the average emissions from our sun, then the new definition applies. The team's future work will include modeling nitrogen escape, which may be comparable to oxygen escape since nitrogen is just slightly lighter than oxygen.